In less than two weeks the European Parliament will vote on its position on the Copyright in the Digital Single Market directive. After the resounding rejection of the JURI mandate on the 5th of July, MEPs are searching for compromises that will allow the European Parliament to enter into negotiations with the Commission and the Member States. A key to finding such a compromise will be a new version of Article 13 that reflects the broad opposition against the upload filters that led to the rejection of the JURI mandate in July. 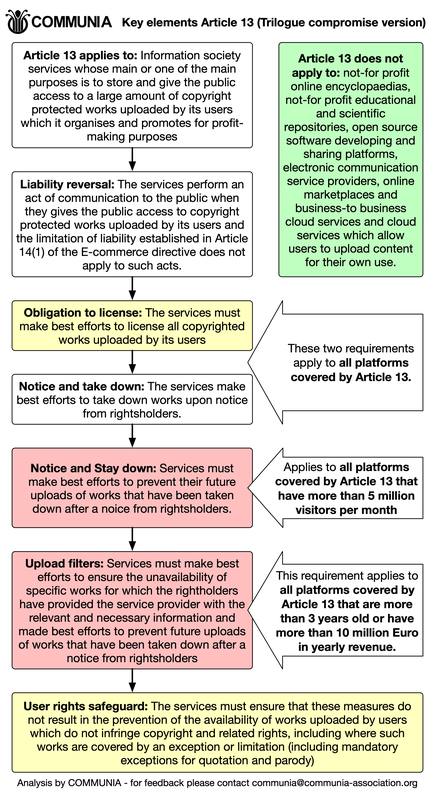 The new proposal for #copyrightdirective does not forsee any measures/„upload filter“ … Now I expect everyone who was against the previous proposal because of this to support the new proposal. 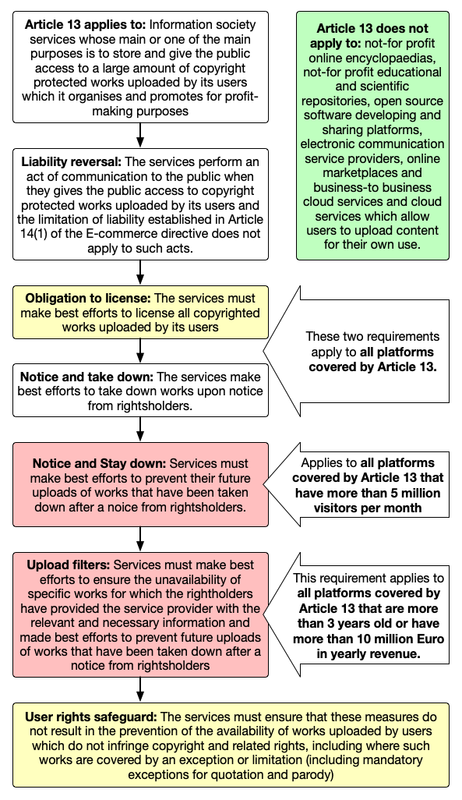 (1) Without prejudice to Article 3(1) and (2) of Directive 2001/29/EC, online content sharing service providers perform an act of communication to the public. As the summer break draws closer both the European Parliament and the Council are intensifying their efforts to wrap up their positions on the proposed Copyright in the Digital Single Market directive. In both legislative bodies Article 13 (the upload filters for online platforms) remains the main stumbling block and both the Bulgarian Council presidency and the EPs rapporteur (MEP Voss) have have set deadlines this week to wrap up the discussion on Article 13. Last week (after yet another inconclusive meeting on Article 13) MEP Voss has asked the political groups to provide him their final written comments “on the MAIN and MOST IMPORTANT open issues” by Wednesday the 23rd. On the same date the Bulgarian Council presidency has scheduled an attaché meeting to discuss the latest compromise proposal. In the light of these (final?) attempts to wrap up the discussion it is important to take another look at how the discussion has evolved since the Commission published its proposal and how the 3 different versions of Article 13 compare to each other. 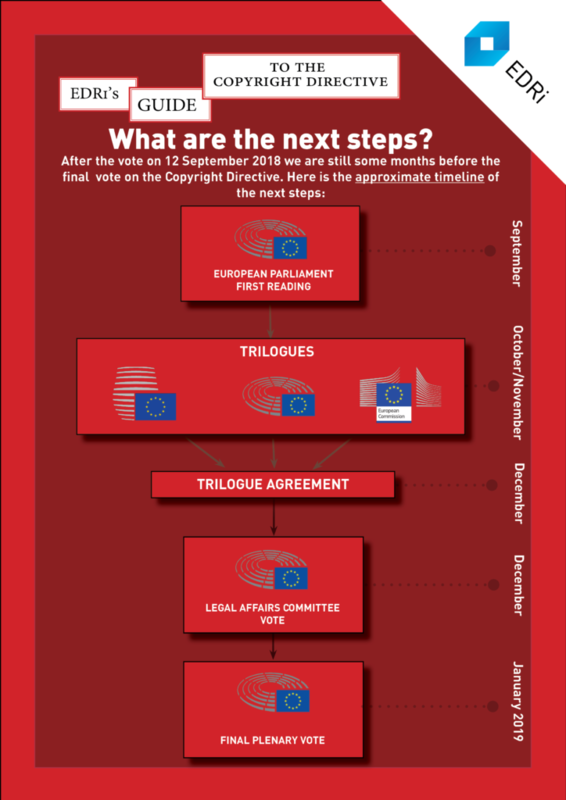 In order to do so we have analysed the internal logic of the Commission proposal, the last Bulgarian compromise proposal and version 6 of the European Parliament’s Legal Affairs committee compromise text and depicted the most important elements in a series of flowcharts (see below). Even a casual glance at these makes it clear that both the Council’s and the Parliament’s changes to the text have resulted in vastly more complex versions. Commission proposal: Simple language that creates a legal mess with lots of uncertainties.